I asked you Question:s about my Dieffenbachia several weeks ago, and you were so spot on and helpful that I want to ask about another houseplant issue I’ve been having. 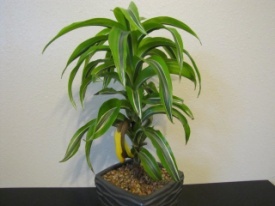 I’m not sure of the type of plant (it was a clearance plant at Lowe’s when I bought it 4-5 years or so ago – photo attached to help). The total height is about 12 inches. It’s never had bugs, and is in a room with moderate light but not in direct sunlight. It’s never really had any problems until recently, in the last few months. 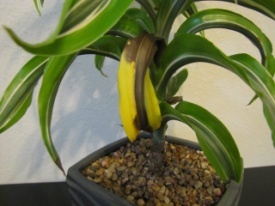 It tends to lose one leaf at a time, turning first yellow then brown and shriveling away. It’s not always the lowest leaf having problems, but always on the lower third of the plant. The top, meanwhile, seems beautifully lush and healthy, but isn’t growing super fast. I’m wondering, is this the normal growth pattern for this type of plant as it matures, or is there a bigger problem going on that I ought to correct? I do trim off the dying leaves one by one as they really get blackened and crisp. Any help or advice would be much appreciated! It is quite normal for plants to lose an occasional lower leaf as new leaves are added on top. Over an extended period of time, your plant will become much taller and will have more bare stem at the bottom. That is because new growth is always at the top and lower leaves are never replaced. There really is not much you can do to prevent that. As long as you are getting as many new leaves on top as you are losing on the bottom, there is no problem. Usually, once a leaf starts to discolor, it continues so it is best to just remove the leaf as soon as it starts to discolor. Keep it within a couple of feet of a sunny window. A few hours of direct sun each day is fine. Otherwise, provide as much indirect sun as possible.